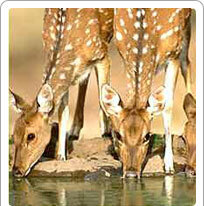 Gajner Wildlife Sanctuary is situated about 32 km from Bikaner. The grounds of the sanctuary house a lake where wild animals can be seen drinking the water, particularly during the summer months. The sanctuary used to be a hunting reserve of the erstwhile royals. Now the dense forests of the wildlife sanctuary house animals like wildfowl, deer, antelope, nilgai, chinkara, black buck, desert fox and wild boar. The lake attracts more than a hundred species of birds, including the Imperial Sand Grouse, especially during the winter season and is a birdwatcher's paradise. The Gajner Wildlife Sanctuary is accessible through the Gajner Palace which is also a heritage hotel. Lodging is at this very hotel and safaris are also available. The hotel provides knowledgeable guides to accompany on the safari. Boats are also available for hire. There is a cycling track as well in the Gajner Palace. The restaurant on the terrace of the hotel also provides spectacular views of the sanctuary, its animals and the birds homing on the lake.